Attorney Jennifer Collins marked 20 years of practicing law in the fall of 2018, a milestone that coincided with her two-year anniversary of joining Cramer & Anderson as a Partner in the Danbury office. Two related themes stitch together her legal tenure—a strong record of achieving meaningful outcomes for clients in Personal Injury Law, Social Security Disability and Workers’ Compensation cases, and a continuing legacy of service, often focused on advocacy and mentoring for constituencies in need of understanding and assistance. Subsequently shifting the focus of her practice to Danbury, Attorney Collins found she was 20 years younger than everyone else, still mostly men. “I felt like I was 12,” she said. “People were amused by me rather than listening to what I was saying.” A judge’s secretary even counseled her to be careful about how she expressed assertiveness. As the legal profession has matured with diversity and greater equity for women, Attorney Collins has thrived. After an initial 12 years with a firm in New Milford, she formed her own small firm in Danbury, Collins & Associates, LLC, where she employed associates and other staff members. Outcomes achieved included settling a Workers’ Compensation claim for $1.2 million. A little more than two years ago, Attorney Collins brought her skill sets and client base to Cramer & Anderson as a Partner based in the firm’s Danbury office. Attorney Collins recently logged a type of rarely achieved success with such a case. “I took a Social Security appeal to Federal district court, where they’re almost never granted,” she said. “I was able to get the appeal sustained on the papers alone. I didn’t even need to argue it in open court.” The case was remanded back to the Social Security Administration’s Hearings Office for reconsideration. Another injury case recently settled for $575,000, and it was one of those cases reflecting the compassion Attorney Taylor describes. Attorney Collins also achieved a Workers’ Compensation settlement exceeding $200,000 for a gas company worker who was badly burned in an explosion—and then went on to change careers and, as a physical therapist, begin to help others who have been burned. It’s not a big leap from the work Attorney Collins does as an attorney to the time and effort she devotes to advocacy and community service. Early in her career, she served as co-chair of the service committee of the Young Lawyers Section of the Connecticut Bar Association, and also was a longtime volunteer sexual assault and domestic violence counselor on the Women’s Center of Greater Danbury’s abuse hotline. These days, Attorney Collins is in her second year as class coordinator for a Lion’s Heart teen service group, which means nurturing and guiding a 15-member group toward earning service hours and eligibility for presidential and congressional service awards. The group, which includes her daughter Jillian, participated in the Women’s Center’s SafeWalk, and also recently made scarves for the homeless. On the agenda is holding another food drive to benefit Ridgefield and Danbury food banks. In other ways, Attorney Collins’ service overlaps with her work as an attorney. 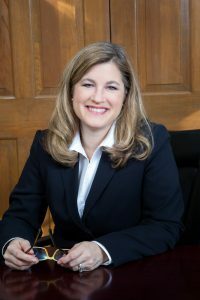 She has long accepted Social Security Disability case referrals on a pro bono basis from Connecticut Legal Services, as well as appointments from local probate courts to assist with matters involving guardianship, child neglect and abuse. Attorney Collins has held a contract with the state to be appointed and serve in Connecticut Juvenile Court, representing indigent parents and children on matters of neglect and abuse, and in 2010 she was appointed to serve as a Connecticut Judicial Branch Magistrate for Small Claims Court and motor vehicle infraction dockets. “I’m one of the youngest magistrates,” said Attorney Collins, who is usually called upon once a week for cases that could take her anywhere in Connecticut. Attorney Collins earned her Bachelor of Arts degree from Fairfield University and her law degree from the Columbus School of Law at the Catholic University of America in Washington, D.C.
She interned for two semesters during law school at the Pentagon for the Office of Legislative Affairs for the U.S. Navy and in Office of the General Counsel of the Department of Defense, researching and drafting regulations for the Uniform Code of Military Justice. Attorney Collins also clerked for multiple superior court judges in New Jersey for two summers during college, and was employed for a full-year term after law school graduation for two criminal judges in Toms River, N.J.
Attorney Collins lives in Ridgefield with her husband and children, where she volunteers within the public schools and supports nonprofits, including the Prospector Theater. She also runs 5Ks such as Run Like a Mother, to help support the Molly Ann Tango Memorial Foundation, and the Super Scout 5K Challenge in Newtown. She may be reached by email at jcollins@crameranderson.com and by phone at (203) 744-1234.